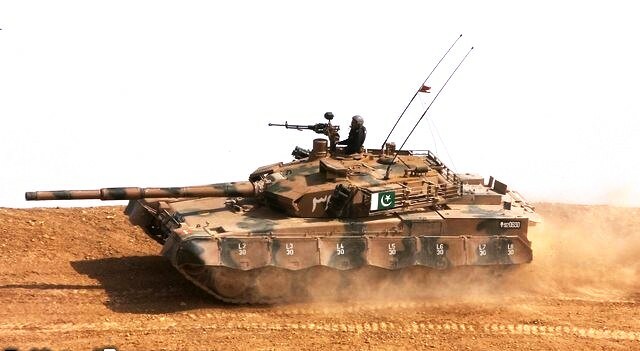 The Al-Khalid is today’s first-line main battle tank of the Pakistani armed forces, given to the best armoured divisions. Its development goes back to the Chinese Type 90 MBT, a relatively small-scale production MBT considered as a semi-experimental series, transitional for the Type 96 MBT. Rough translation of “Al Khalid tank” is “the immortal tank” but the true origin remains the 7th-century Muslim commander Khalid bin al-Walid (592-642 AD). It is remarkable for its extremely modular conception, likely to be modified with foreign powerplants and subsystems. Of low silhouette, light and compact, it is nonetheless armed with the same 125 mm smoothbore able to fire ammo comparable to all NATO standards and ATGMs. The Al Khalid MBT encountered some export success early on. 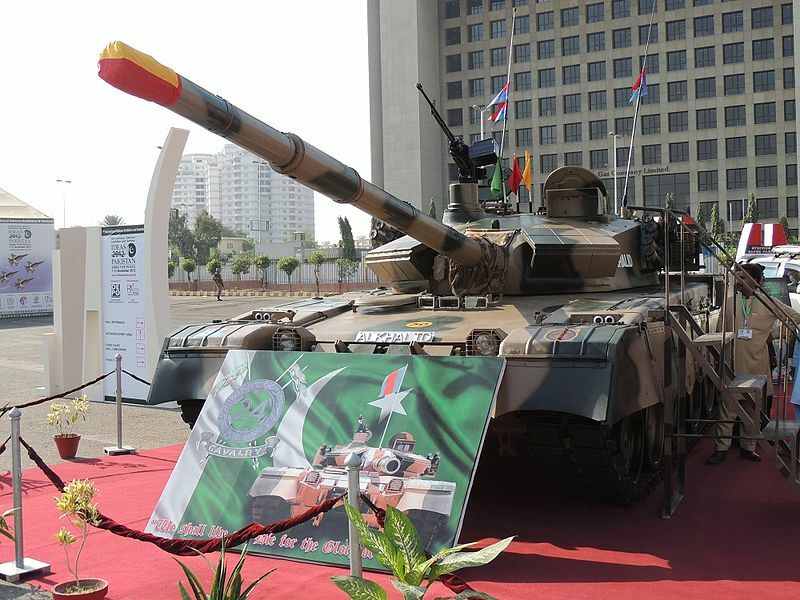 The Type-90-IIM at the origin of the project also produced under license by Pakistan. All started when a joint development deal was signed between China and Pakistan back in January 1990. Chinese prototypes were to be tested in Pakistan, notably for exports in the middle east, along with some technology transfers. 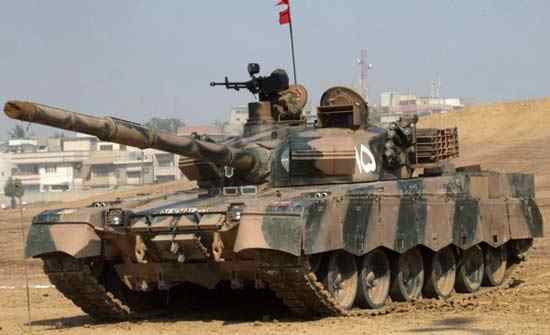 Tests began in the summer of 1991 whereas Pakistan completed its first tank plant at Taxila HIT or Heavy Industries of Taxila (The former Takshashila, Punjab, the old capital of Gandhara) in late 1992. Lt. Gen. Hamid Javaid and Major General Muhammad Asad supervised the joint development with China, building and testing several prototypes along with a nine-year long programme. A variety of foreign-built powerplants were purchased and tested. Indeed, one aspect China was quite interested in was the development of high-performance cooling and air filtering system that could not be tested properly in China mainland. In the process, a Renk 304 transmission and modern active hydrogas suspensions units were tested but not retained. -P3: Ukrainian 6TD-2 1,200 hp diesel powerplant. This last version was proven more adaptable to hot climates and way cheaper and was subsequently chosen for further developments. This joint MBT became the Chinese Type 90-IIM and was also presented for export in 2001 as the MBT 2000. The latter was derived from the P4 (fourth) prototype, featuring a German NATO 120 mm gun, Western FCS and German MTU-871/TCM AVDS-1790 diesel plus Renk LSG-3000 automatic transmission. Pakistani Al Khalid on field tests, notice the side skirts identification numbers. In the meantime, HIT had license-produced 300 of the Chinese Type 85-IIAP (85-IIA variant) which had a 125 mm smoothbore combined with an auto-loader. They were later upgraded to the Type 85-III standard and gave both valuable experience and finances to the complex. 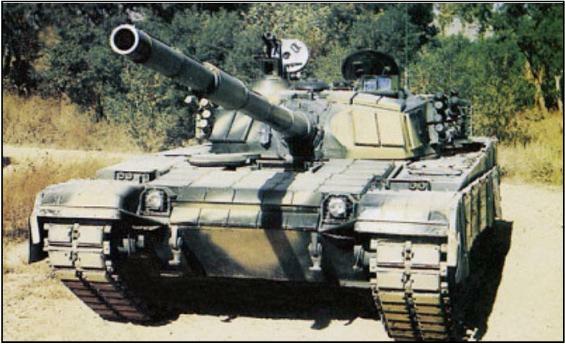 In 1999 the plant geared up for the production of the future Al Khalid, delivering a pilot batch of 15 tanks in 2001, tested in an active unit. A contract was signed with Malyshev Factory in May 2002 for the delivery of 315 KMDB 6TD-2 diesel engines. In 2004 a second batch was delivered and production was scaled up for the planned delivery of 600 MBTs within the space of fifteen years and more. Several countries tested it and some purchased it as the MBT-2000 (export name). HIT is now in the process of modernizing the Al Khalid as the “Al Khalid II”. The basic hull made of high hardened steel plates over RHA. In addition the sides comprises composite armour modules, but most are found on the turret, which is a derivative of the new faceted model developed for the Type 85, which succeed in China to the old soviet cast model. The turret is quite influenced by the one found on the T-72 and probably have features similar to the “Dolly Parton” armour and comprises classified elements and nera inserts. Explosive Reactive Armour (ERA) bricks covers the turret front, roof, sides and hull glacis. This AORAK Mk.2 active protection is developed by the Global Industrial Defence Solutions (GIDS) Corporation. Pakistani Al Khalid MBT of an operational unit in the 2000s. In addition the crew protection is assumed by a collective NBC system with overpressure, internal fire extinguisher and explosion-suppression system. There is also probably a climatiser. External protection includes smoke dischargers (six mortars per side) capable of firing smoke, Chaff, or antipersonal grenades. There is also an engine smoke generator system, while the tank had a coating of infra-red reflective paint. It is equipped with the ATCOP LTS 1 laser warning system mounted on a 360° traverse mast-mounted sensor. Laser detection operating in the 0.8 to 1.06 um waveband, not only triggers warnings but can active automatically activate countermeasures depending of the distance. It is completed by the early Laser Threat Sensor LTS786P and could differentiate the laser signals nature in a 10 km radius. Mobility is well served by a 6TD-2 liquid-cooled diesel engine designed by the Kharkiv Morozov Design Bureau (KMDB) of Ukraine. It gives a raw engine power of 1 200 hp, resulting in a top road speed of 70 km/h for a range of 430 km. Thanks to the lightweight hull (46 tons vs 55-70 for many Western MBTs) and compact yet powerful engine, its power-to-weight ratio of 26.66 hp/tonne traduce itself in accelerations from 0 to 32 kph in just 10 seconds. For compacity, pistons are arranged horizontally in an opposed piston configuration. This also helps maintaining the silhouette down. This engine is also used by the T-80U MBT. It is coupled with a French hydro-mechanical automatic transmission SESM ESM500 also shared by the Leclerc. With a 5 forward and 2 reverse it is power-assisted, torque converted controlled, and allows automatic or manual steering. In addition there are carbon friction brakes and a secondary speed-retarding system and a manual backup system. The hull rests on a 6 wheels Field tests proved the MBT-2000 can climb a 60% gradient, 40% side slope, 85 cm vertical spet, cross a trench 3 m wide, of ford 1.40 m without preparation and 5 m with preparation. For navigation, the Al Khalid is given a and INS (Inertial) and a GPS system. The main armament relies on a 125 mm of 48 cal. smoothbore gun, which have an auto-frettaged and chrome-plated gun barrel. Its manufacture calls for a highly stiff electroslag remelting steel for an estimated life cycle of 1100 rounds EFC. It is now manufactured in Pakistan since 2011 by the Heavy Mechanical Complex (HMC) and People’s Steel Mills Limited (PSML) after a long running programme of testings since 2000. Its very high pressure ensure to fire APFSDS, HEAT FS and guided missile to great velocities. Derived from the Chinese ZPT-98, this gun is fully compatible with Ukrainian gun ATMs. Among other rounds, the Al Khalid fires the Pakistani Naiza 125 mm depleted uranium (DU) round which have an estimated penetration of 570 mm RHA at 2000 m.
The gun is assisted by a muzzle reference system and dual-axis stabilisation system. Elevation/depression is served by electro-hydraulic power drives while the autoloader comprised 24 ready ammunitions stored in a cheesebox style magazine and have a steady rate of fire of 8 rpm. Secondary armament comprises a coaxial 7.62 mm light machine gun and the commander’s 12.7 mm roof-mounted multipurpose heavy machine gun (Chinese built). Al Khalid I on the 2012 IDEAS military exhibition held in Karachi. In the turret, the gunner has a dual-magnification day sight while the commander is given a panoramic sight, both with a dual-axis image stabiliation and independent laser range-finders allowing a hunter-killer mode. The automatic target-tracking system is optimized for accurate fire on the move and fast-moving targets. Both also have dual magnification thermal imagers for night vision integrated with the FCS. The latter is derived from Western models but was initially provided by Norinco for demonstration, and gather data inputs from ten sensors, with less than 1 second ballistic computation time. Overall range is about 7,000 m, the laser rangefinder being calibrated to 9,990 m. Sights, sensors, FCS and gun control system are of French manufacture. Export version derived from the Type 90-IIM and apparented to the Al Khalid, first unveiled at the Abu Dhabi Military exhibition in 2001. It is given the Ukrainian KMDB 1,200 hp 6TD-2 diesel engine. The Type 90-IIA was an attempt re-engineered with a French 1,500 hp V-series diesel, which was cancelled. The latest Chinese export variant of the Type 90-IIM also called MBT-3000, equipped with Chinese equipments, turret, gun, electronics, armour and 1,300 hp diesel engine. This an upgraded variant of the base Al Khalid, which comprises a larger rounds capacity (from 39 to 49 rounds) higher carousel, 1,500 rounds capacity for the 12.7 mm HMG (instead of 500) and 7,000 for the coaxial LMG (instead of 3,000). The FCS in upgraded with a modern multi process computer allowing a 7,000 m identification range and a 3,500 m engagement range. The autoloader is modernized and digitally controlled for 9 rpm, new displays are given with more available data and better battelfield awareness. The turret receives also the latest Ukrainian Varta electro-optical jammer, French Sagem 3rd gen. thermal imagers. For crew comfort, the air conditioning system is also enhanced. Apperently the Ukrainian 1,200 hp engine is also more efficient, giving a top speed of 72 kph for 47 tonnes. According to the Pakistani military experts, the modernization is focused on improving the electronics and control systems, whereas the practical rate of fire is to be raised up to 9 shots per minute. Active prortection relies on the Ukrainian opto-electronic Varta blinding system, a jamming laser seeker, upgraded rangefinders and designators, plus a 3rd generation french Sage imager. According to “Pakistan Military Consortium” Usman Shabbir, the new Al Khalid integrates components of the Chinese Type 99 MBT, like the SB gun. Heavier, it has a redesigned turret and improved armour modules, new sensors, improved ammunitions, an Integrated Battle Management System (IBMS) and a new 1,500 hp powerpack. It is scheduled for production and also serves as a long-term modernization/upgrade programme for the Al Khalid of 1st generation. Outside Pakistan (600 on order, already 500+ in service), the Al Khalid was also exported as the VT1A to Bangladesh (44 since 2011), Morocco (54 + 96 -the latter of Chinese manufacture- since 2011), Sri Lanka (22 in 2014-2015), and Myanmar (Unknown). Peru tested the model and compared it with other MBTs but eventually the purchase contract and programme was cancelled for budgetary reasons. 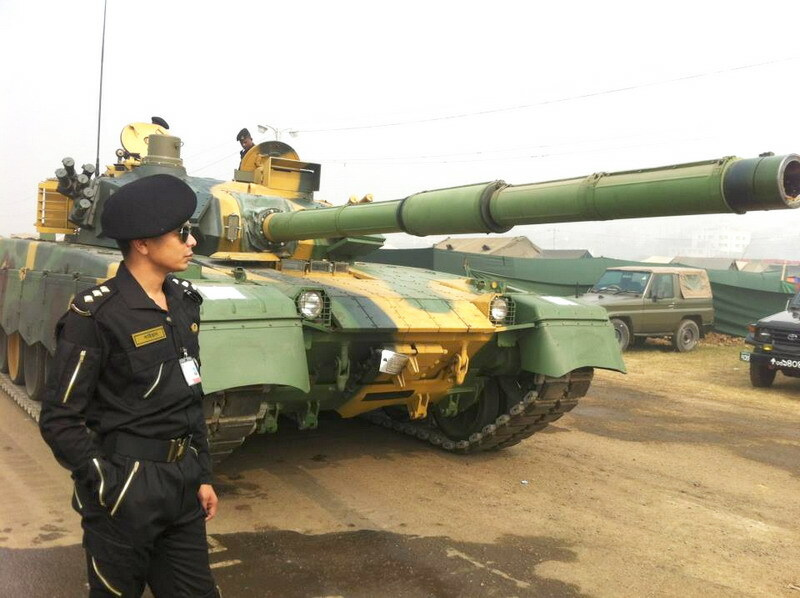 It should be noted that Pakistan now pursue the development of a local licence version of the Chinese export VT-4/MBT-3000, locally evaluated as the Al-Hyder MBT. It is scheduled for 2016 and Pekin claims superior performances to the Russian T-14 Armata. Crew 3 (commander, driver, gunner). Al Khalid of the Myanmar Army in 2014. First of all,this is one of my favourite websites on the interesting.I love your pages about different kind of tanks and the accurate facts and numbers.I’m not an expert about tanks or any kind of aramament,but i do have a question since our country recently bought a few of these.I hope i get an answer soon. How does this tank perform compared to other modern tanks like the American M1 Abrams,The british chally mk2 and the The German leopard and all the other modern tanks fielded by the 1st world nations? Thanks and keep up the great work.Special thanks to the one eho draws the pictures of the different variants of the tanks.